The first twelve weeks of the 2018/19 marketing year, which started on 1 September 2018, have painted a dire picture for US soya bean exports which are 43% lower than in the same period last season. Down from 21 million tonnes of accumulated exports by 23 November 2017 to 11.9 million tonnes by 22 November 2018. A loss of 122 Panamax (75,000 tonnes) or 183 Supramax (50,000 tonnes) loads. “Tonne mile demand is further hurt as not only are the volumes of US soya bean exports lower than last year, the distances sailed are also much shorter as the new destinations are closer to the US than China is.” Peter Sand, BIMCO’s Chief Shipping Analyst, says. 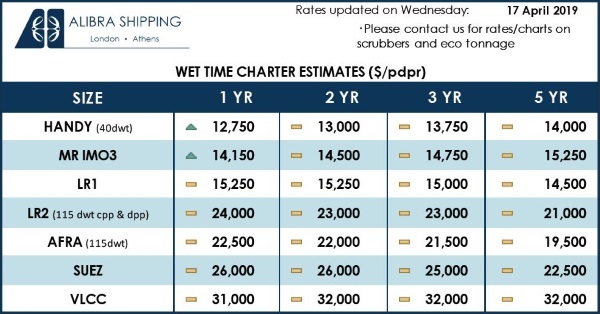 The loss of 122 Panamax loads (all destinations) may be downplaying the impact the change in US soya bean exporting patterns is having on the dry bulk shipping industry. By 23 November 2017, 71.3% of all soya bean exports were sent to China, equal to 200 Panamax loads on one of the longest trades in the world. So far this marketing year, China has taken just 2.8% of US soya bean exports, further harming the tonne mile demand generated by US soya bean exports. 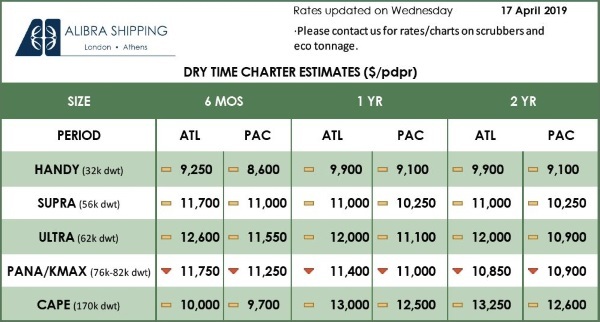 In particular Panamax and Supramax vessels are affected given their reliance on the high volumes of US soya beans usually being sent to China at this time of year. The drop in this demand has been one of the factors behind the lack of seasonal upswing in earnings which has been seen in previous fourth quarters. 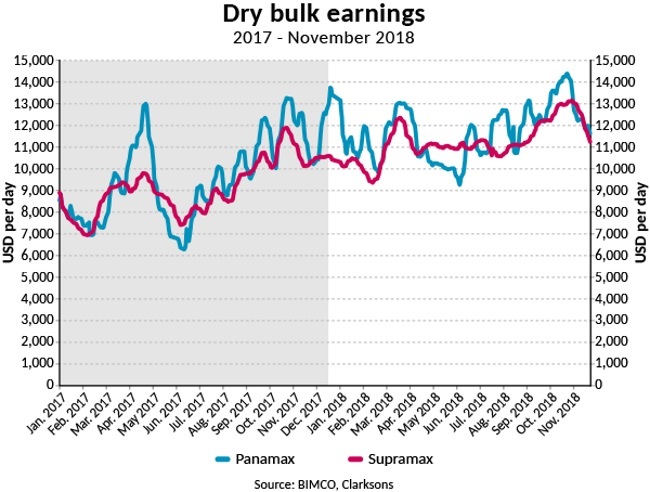 Panamax earnings fell from 14,385 USD/day on 17 October 2018, to 10,996 USD/day on 23 November 2018. 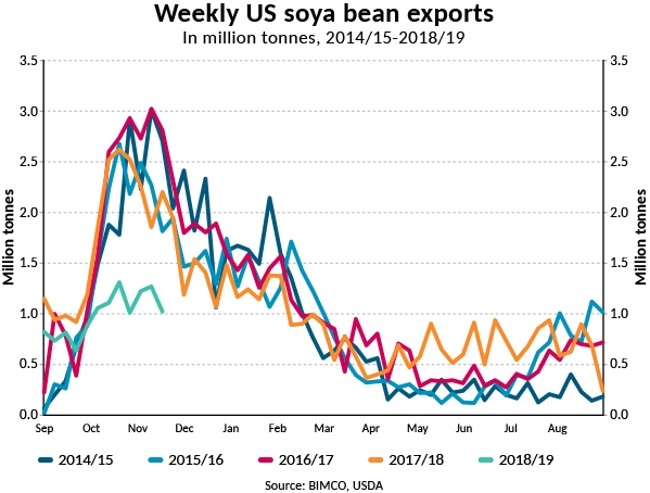 So far this season only two countries have imported more than a million tonnes of US soya beans, a fraction of the Chinese levels seen in previous seasons. Argentina has gone from no imports of US soya beans at this time last year, to topping the list with 1.21 million tonnes. A remarkable surge but in no way enough to make up for the loss in exports to China. Mexico takes the second sport with 1.18 million tonnes, a 21.6% increase compared to last season. Despite anecdotal evidence, data from the USDA and backed up by Brazilian customs statistics showed that the US hadn’t exported any soya beans to brazil between the start of the season on 1 September 2018 to 22 November 2018. During the 2017/18 marketing year, the US only exported 100 tonnes of soya beans to Brazil. Although the 25% tariff on Chinese imports of US soya beans was implemented on 6 July 2018, its effects have only really started to show since the start of the fourth quarter. Last year, 55% of US soya bean exports to China occurred between October and December. Although US exports to China have dropped by 98% since 1 September compared to the same period last season, total Chinese imports of soya beans in the period from January 2018 to October 2018, have only fallen 0.5%, largely due to increased imports from Brazil. However, the US dominates the soya bean export market in the last quarter of the year, and we are therefore likely to see total Chinese soya bean imports be lower than last year. “Hopes of a resolution to the US-China trade war before the end of the year rest on the upcoming G20 summit, but even in the unlikely event that all tariffs are immediately revoked, the trade war may have a long-term effect on trade between the two nations. As evidenced by China halting imports of US crude oil despite it not being an official part of the trade war, tariffs are not the only factor which have and most likely will continue to harm trade between the two nations. If Chinese farmers decide they need fewer soya beans to feed their livestock, the overall Chinese demand for soya beans could be permanently reduced, even if tariffs are removed.” Peter Sand ends.